Sofia Carson, Maddie Ziegler and Noah Cyrus strike a pose on the red carpet while attending Variety’s Power of Young Hollywood event on Tuesday night (August 28) at the Sunset Tower Hotel in West Hollywood, Calif. The three ladies showed off their fierce style alongside guests Madison Beer, Chandler Kinney, Cierra Ramirez, Daya, Dinah Jane, Emeraude Toubia, Emma Kenney, Jenna Ortega, Mackenzie Foy and Maddie‘s sister Mackenzie Ziegler. Shawn Mendes, Amandla Stenberg and Lili Reinhart served as the honorees for the evening. FYI: Sofia is wearing a Monique Lhuillier dress. Maddie is wearing a kate spade new york top with a DROMe skirt and Jimmy Choo shoes. Mackenzie is wearing a Rodarte ensemble paired with Roger Vivier shoes. Emeraude is wearing a Monique Lhuillier sequined asymmetrical slim dress. Jenna is wearing a Marissa Webb look and a Salar Milano bag. 'The Fosters' Cast Discuss Their Final Season on 'Ellen' - Watch Now! The cast of The Fosters are having a lot of fun together! 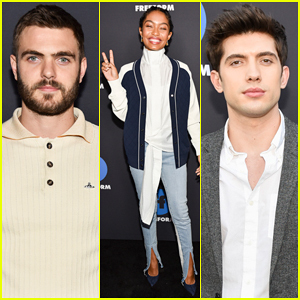 Teri Polo, Sherri Saum, Maia Mitchell, David Lambert, Cierra Ramirez, Hayden Byerly and Noah Centineo all appeared on The Ellen DeGeneres Show on Monday (February 19). During their appearance, Ellen chatted with the cast about the family drama’s fifth and final season. And yes, a few of them even admit to taking some special momentos from the set of their show! Plus, Ellen surprises them with an adorable gift: a 7-person sweater to remain a “close-knit family forever.” Too cute! Which ’The Fosters’ Cast Member Stole the Most Stuff from the Set?